One problem with fall and winter cycling is keeping your hands warm. Regular fingerless cycling gloves won’t do it. You can buy full-finger “cool-weather” cycling gloves for about $30 and up, but they don’t have any insulation to speak o. (They do feature bright day-glo colors and reflective materials, which is good for safety, especially since night comes early in winter. Responsible cyclists use their hands to signal turns, so their hands need to be visible.) You can wear regular winter gloves, but they tend to be black, and often aren’t very flexible. But these gloves have it all. “Clutch Gear” seems to be Superior Glove’s line of close-fitting, comfortable work gloves. 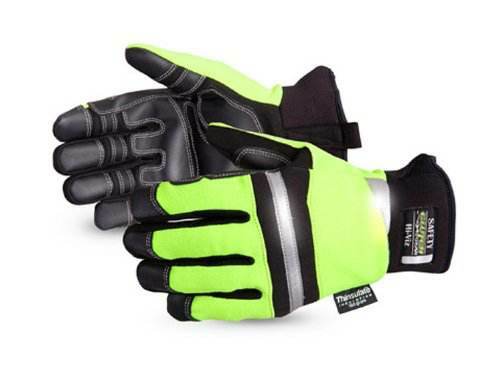 These particular gloves come in bright lime green, with strips of reflective material across the knuckles and wrist. They have a waterproof/breathable membrane similar to Gore-Tex, and though in my experience such membranes in gloves haven’t always stayed waterproof, they do make the gloves reliably windproof. The gloves are insulated with 100-gram Thinsulate, a premium material often used in gloves and boots. The palms and fingers have a layer of high-grip, abrasion-resistant PVC material. Being mechanic’s gloves, they are pre-curved and quite flexible, making braking and shifting easy. It hasn’t been cold enough yet here to see how warm they are, but having experience with gloves of similar construction, I have no worries. They will work until there is several inches of snow on the ground. In the Large size, on Amazon, they cost $11. I cannot fathom why. Other sizes cost $33, which is about par for these materials and construction. So if you wear size Large gloves and want to have the warmest, safest, cheapest cycling gloves there are, get these. If you don’t wear size Large, they are still a great glove for a reasonable price.